Refresh your entryway this fall with a bold Krylon® green, metallic finish, and marble texture! In a well-ventilated area, cover a flat surface with a drop cloth or tarp to protect from overspray. Make sure the surface of the entryway table is clean, dull, and dry and then place it on the drop cloth or tarp. Remove the hardware from the table. After reading the label for safety and application instructions, spray paint the entire entryway table with Krylon® ColorMaster Paint + Primer in Satin Hunter Green. To achieve the pictured look, use 2-3 coats. Paint the hardware using Krylon® Premium Metallic in Copper Foil. To achieve the pictured look, use 3 coats on all hardware pieces. Once the entryway table and hardware are fully dry, reattach the hardware to the table and place in your entryway! For additional character, spray paint assorted décor pieces in a well-ventilated area to place on the entryway table. • The leaf platter is painted with 2 coats of Krylon® Premium Metallic in Copper Foil. Once fully dry, place platter on table and put pinecones on platter. 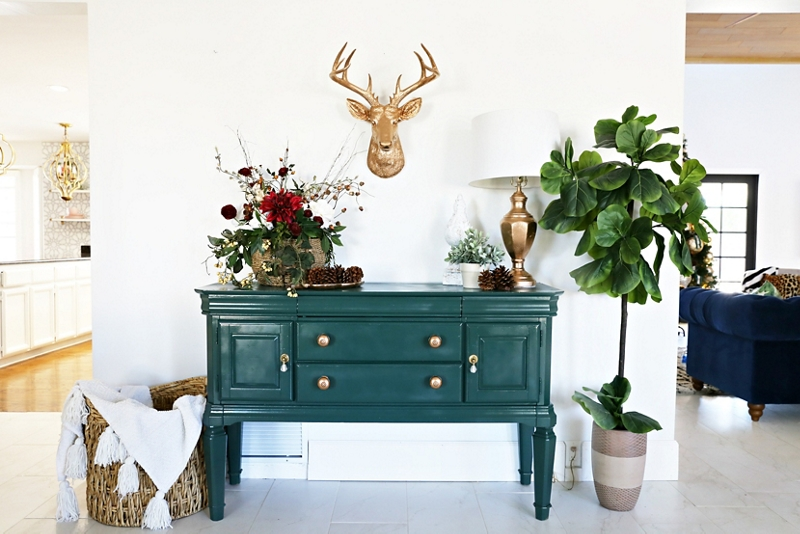 • Spray a faux deer head in with 2 coats of Krylon® Premium Metallic in Copper Foil. Once fully dry, hang above entryway table. • Spray the lamp with 2 coats of Krylon® Premium Metallic in Copper Foil. Allow to dry fully and place on entryway table. • Spray the decorative accessory with Krylon® ColorMaster Paint + Primer in Satin White. Once the base coat is fully dry, spray the piece with Krylon® Marbelizing Spray in Gold Chiffon for a marble effect. Style all décor pieces and plants on and around the entryway table and wait for guests to compliment!